Well, there has been plenty of talk of late about Lasalle here in Christchurch, I have done my best drug-dealer impersonation by getting Jason hooked; and Jamie is not far away (whether he knows that or not!). So, with Jas starting some Peninsular British, it seemed only fitting for me to start some Peninsula French. The French Army that was sent to the Peninsula was.... ecclectic. There were a few veteran troops, but the majority was made up of fresh conscripts- lets be honest with Russia going on, quality French soldiers were well stretched! These conscripts were fresh, and had a pretty mixed review when it came to combat. In addition there were one of my favourite Napoleonic units, the Swiss. These guys were mercenaries, who fought for Napoleon in almost all of his campaigns, and were some of the best troops in his army. Interestingly, the swiss did not fight in the Hundred Days (which culminated at Waterloo), because after the exile of Napoleon (for the 2nd to last time), the swiss had formed an agreement with the returning monarchy, which they honoured rather than returning to fight for Napoleon. Plus, they wore standard French uniforms, but in red! So, without further adieu, here are some simply horrible pictures of my first stand of French, which is a stand of Swiss! 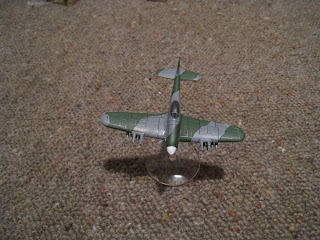 And for those who read this for Flames of War stuff, my typhoons are progressing well. They are all at the stage of getting blacklined with a lovely ink pen, which takes fricking ages. And is boring as sin to do. So I would expect it to take a fair while, like a week very much on and off, where I will do some for 5 mins, then do something else. 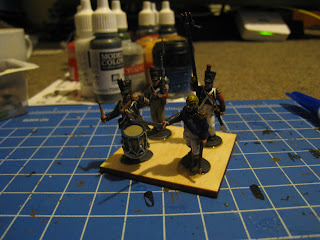 Like paint Napoleonics! Here is one, showing off some of the blacklining. I will add some decals, then it needs a big coat of matt varnish. Well I can't start THIS week. Anyway, you are now doing the army I was supposed to be doing so I am free to consider anything and everything once more. Not this week, but next week? Thinking warclouds next year for the first south island lasalle comp! As to beating you to peninsula French, though it would be nice to have variety, French are pretty ubiquitous in this period! You can never really have too many of them! That being said, all of the armies have at least one plastic box now, once the warlord Russians come out. Getting to consider the full range of possibilities is definitely a good thing. I just wish Chasseur Cav was in plastic. True! Tell you what, you get a napoleonics army, and I will get an impetus army! No chasseurs is a pain, I am guessing you saw the appeal of organic light cav too? Have to figure out what Cav to get for French. I take the fact that EVERY single list I see sports organic cav to mean that I must have it. On the other hand, Cuirassiers. As to Impetvs, I count Me, Jason, Andy, Keith, Nathan, Adam, one of Jason's mates + Craig et al and of course I have enough to provide two Roman armies so Chris W also. That would make a pretty good event right there if we got even a subset. You know you want to. Jason and I had the craziest game tonight: both of us had to sit out a turn at different points in the game because our general fluffed it, units that were flank charged just wouldn't die, every wood and hill was full of crazed Germans and the whole battle was essentially a mess in which we improvised and prayed nothing bad would happen to us that turn. You'd love it. I think at this stage my French will get elite infantry support- just so I can have the Swiss regiments. But I do still get one unit of dragoons since it is a peninsula force. Organic light cav is good- not waiting for reserves is nice. But then again, choose a different period and have allied polish lancers! Yes, I am intrigued by Lasalle as well, however. I must get my Impetus army sorted first, as well as played. I've just ordered some Typhoons to help out my commandos. Were they OK to put together? I also hope they are good in the game, what do you reckon? The tiffies were easy as anything to put together, just have to glue the rockets on the undersides. I give them a wash with some dishwashing liquid to take off the release agent on the resin. I also used some of the BF tank turret magnets and attached one to the underside of the plane, one to the flying base, to make them stay aloft much better, given they have to travel. In game terms they are damn lethal. 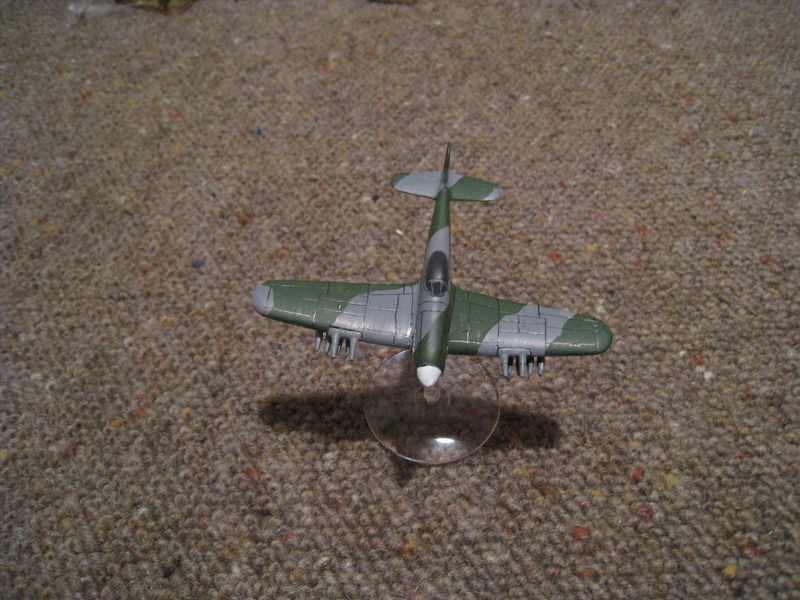 They suffer the same disadvantages as other planes, but their firepower is basically unmatched. For the commandos, it should provide you with the ability to reach out and slap tanks at range, which will inspire them to come closer to your Piats!